All too often, rural lifestyles are held up as the model for those who wish to have low impact on the planet. Environmentalism is often associated with country living and organic gardens. Ironically, urban dwellers provide a better model for low impact living than their country counterparts, in most cases. Photos by region, by subject, contact. 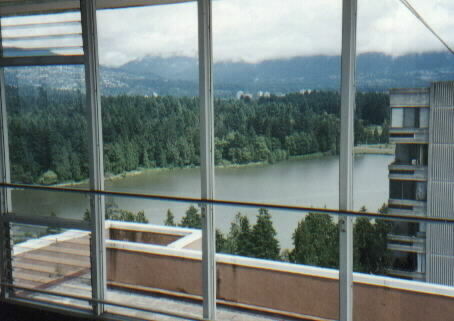 Stanely Park is just an easy walk away, the view from these Vancouver West End condominium towers is superb. With community events near by, this neighborhood is noted as a friendly place for gay, single and retired folks. People who live in the country, where things are farther apart, tend to drive more. I often hear that use of public transit correlates with population density of the area being studied. Residents of a dense urban neighborhood are far more likely to use transit, walk or bike than people in low density areas. 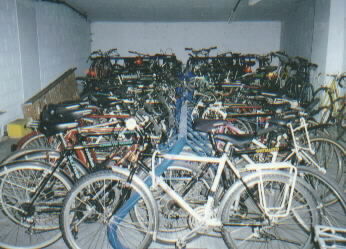 The building I visited had a bicycle parking garage. With 40% of space, in some areas, devoted to asphalt for cars, it is nice to see how little space bicycles consume. Only a slightly larger room could serve these residents with greater comfort. Streets in the west end are surprisingly quiet for the number of people living there. Apartment dwellers are less apt to put fertilizers on their lawns, have leaking septic tanks or cook on wood stoves than rural people. Home heating costs less also. 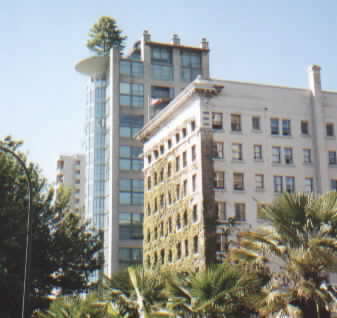 Apartments tend to have less surface area exposed to outside air. This list of advantages goes on and on. Why isn't there a huge movement, among environmentalists, to promote urban living? Yes there are some concepts around the edges, such as "New Urbanism" in architecture, but city dwellers are often the un sung heroes of low impact living. The price one must pay to live this efficient lifestyle can be prohibitive. Big city rents and mortgages are skyrocketing in many areas. This is because low density development, in the suburbs, is creating a traffic nightmare. Weary of long commutes, people are rediscovering the virtues of living with in walking distance of things. This demand is driving up housing costs in walk able neighborhoods. The most efficient neighborhoods are, unfortunately, becoming the most expensive. Not only are urban dwellers somewhat ignored by many environmentalists, they are even an endangered species. Folks of modest means are often priced out of the city and forced to move to rural areas in search of affordable housing. People, who would prefer simpler lifestyles, are forced to live with long commutes and other rural hassles while the denser parts of cities are becoming the provence of the wealthy. As efficient people get priced out of efficient neighborhoods, environmentalists should be seeking solutions. Some are, but too many prefer escaping to the fantasy of a lost rural America; a dreamland that is being paved over with population growth. Back in the 1960s, an advertisement stated that "Grape Nuts Cereal helps you grow up instead of growing out." Our urban planners could head that advise. A bigger supply of dense, walk able areas could bring the cost of these neighborhoods down. 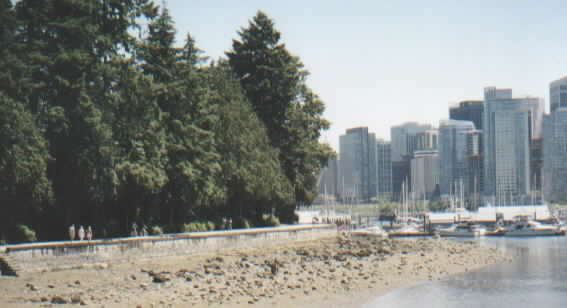 An urban forest, Stanley Park, in Vancouver, BC. provides a nice foreground to the downtown buildings. 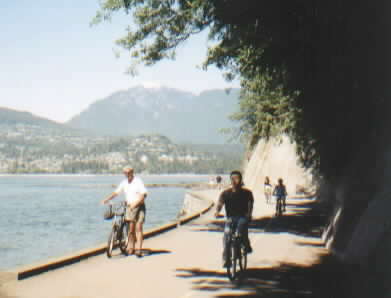 Seawall bike path can be crowded on a sunny day. It is a "one way" route to avoid collisions. Walkers have separate path. 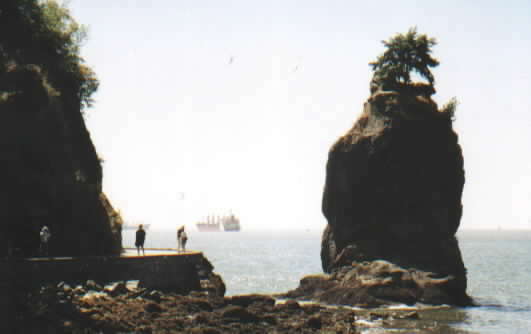 Images taken summer 2003. Still not far from downtown. 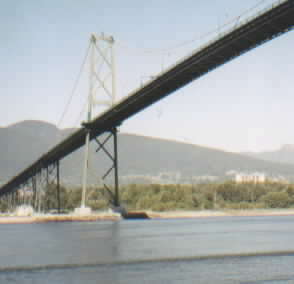 Back around toward town again in English Bay area. Nature and city interacting.